Eataly’s first store was opened in Turin in 2007. Our goal is to introduce a new way of distributing high quality agricultural products, inspired by leitmotifs as such as sustainability, responsibility and sharing.. 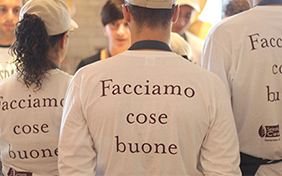 The brand EATALY is the combination of two English words: EAT and ITALY. Eataly is about eating Italian food, but not it’s not just about Italian food. That "Italian" way of indulging at the table is the result of the extent to which Italians enjoy excellent Mediterranean cuisine combined with Italy’s food and wine culture and history, the easy reproduction of many dishes of poor origin, along with many positive influences that Italian cuisine has gained from abroad over history (for example, with tomatoes and corn coming from America). Eataly’s main goal is to demonstrate that high-quality products can be made available to everyone: easy to find and at affordable prices, but that’s not all. Eataly wants to communicate faces, production methods and stories of people and companies who make the best Italian high quality food and wine. 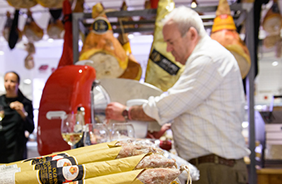 Eataly’s brand was born by aggregating a number of small companies operating in the food and wine compartment. It encompasses the famous durum wheat pasta from Gragnano, Piedmont’s egg pasta, mineral water from the Marittime Alps, Veneto and Piedmont’s wines, Ponente Riviera Ligure oil, Piedmont’s fassone meat, and traditional Italian cheese and cold cuts. Since its first opening, Eataly has been able to offer the best artisan products at reasonable prices by creating a direct relation between producers and distributors, and focusing on sustainability, responsibility and sharing.